Many are aware of the harmful effects of concrete dust, aka crystalline silica, and make a conscious effort to protect themselves from overexposure. However, countless lives are still being impacted from the negative effects of silicosis, lung cancer, chronic obstructive pulmonary disease (COPD), and kidney disease. On August 23, 2013, the Occupational Safety and Health Administration (OSHA) proposed new standards to toughen its regulation of silica dust exposure, like turning toward wet methods. Water effectively eliminates silica dust, and keeps workers safe. As the water combines with the concrete dust, it creates slurry that Gelmaxx helps dispose of safely in any standard trash can. 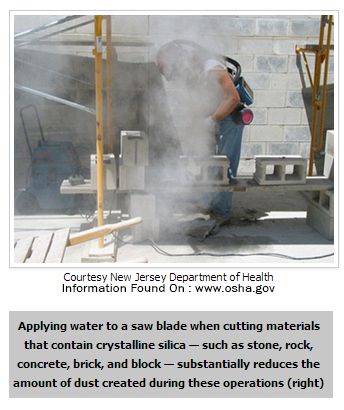 Crystalline silica is a slow acting agent that does not pose a problem until it is too late. Dry concrete grinding or cutting fills the air with harmful silica dust throughout the entire jobsite. Silicosis results from exposure to low concentrations of silica dust over a long period of time, which usually spans from ten or more years. This slow process lures contractors into a false sense of hope that their health is unaffected, but their lungs are slowly deteriorating. Lungs are naturally able to filter out regular dust and dirt, but silica dust is too small for the lungs’ filtering system to be effective. What New Rules Are OSHA Proposing? Currently, the daily permissible exposure limit (PEL) is about 100 µg (micrograms)/M3 for most industries and 250 µg/M3 for construction. With OSHA’s new proposal, they would like to cut this limit in half to 50 µg/M3 throughout every industry. Find out more about these requirements at OSHA’s website. 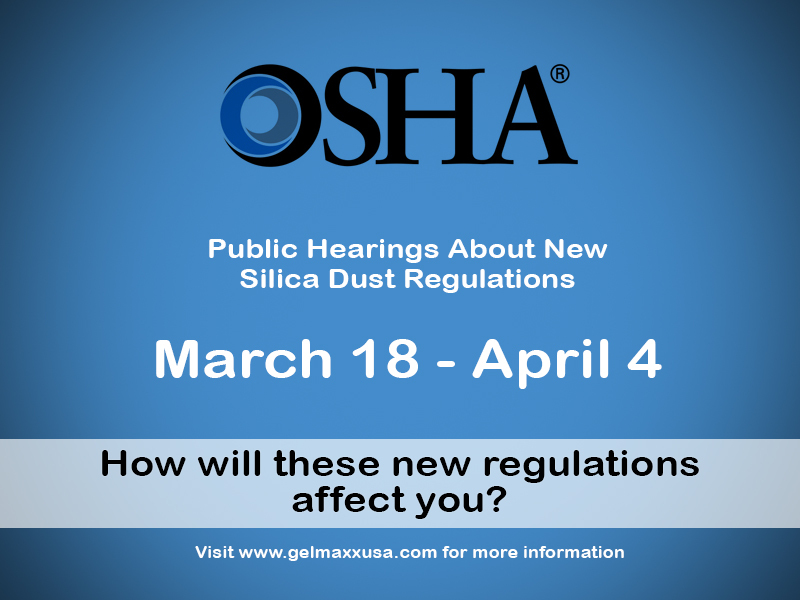 On March 18, 2014 - April 4, 2014, there will be a public hearing on OSHA's proposed silica dust rules at the Department of Labor's Frances Perkins Building in Washington, D.C. Let your voice be heard. Those who file a timely written notice of intention to appear are able to testify and ask questions of agency officials and other witnesses during public hearings. More than 200 people filed notices of their intent to testify at the public hearing. The purpose of the hearing is to provide information and clarification that complements the written comments that OSHA has received. The hearing will be presided over by an administrative law judge where participants can present their opinions and evidence on the subject of silica dust. Check out the schedule of appearances before the court. We will provide more information about the hearings as they progress. With all of these new standard practices, although practical and necessary, silica dust prevention will become costly on the employers and time consuming for the industry. Turning to a wet alternative is an extremely efficient and affordable direction to take. By using water to subdue the crystalline silica, it creates wet slurry that Gelmaxx helps dispose of responsibly. The two-part Gelmaxx system first separates the water from the concrete slurry with the AQUAmaxx separator. By separating the water, you are reducing your waste and producing clean water that you can reuse in your machines. To dispose of the leftover slurry, the ECO-QUICKgel solidifier absorbs the liquid and turns it into a dry material that is safe to dispose directly into any standard trash can. Feel confident because Gelmaxx is EPA compliant and eco-friendly. Currently, these standards are merely a proposal by OSHA, but it demonstrates the direction that the concrete industry is heading towards. Contractors will need to adopt a wet cutting or grinding method, and Gelmaxx will provide the ultimate concrete slurry solution.